Metropolis Comics in Burnaby is one of my favourite comic stores. Jonny (the owner) really, really loves Free Comic Book Day: the annual event major comic publishers sponsor once a year in comic stores across the continent. In fact, he loves it so much that doing it once a year is not enough to keep him happy. Hence, Free Comic Book Day 2 this Saturday, in which he will be giving away 3000 free comics entirely on his own accord, and throwing a big sale for everything else in the store. He's also inviting in some local cartoonists to party and peddle their wares... and one of 'em is me! So if you can make it in to Burnaby this Saturday, come by and say hello! It should be a lot of fun. 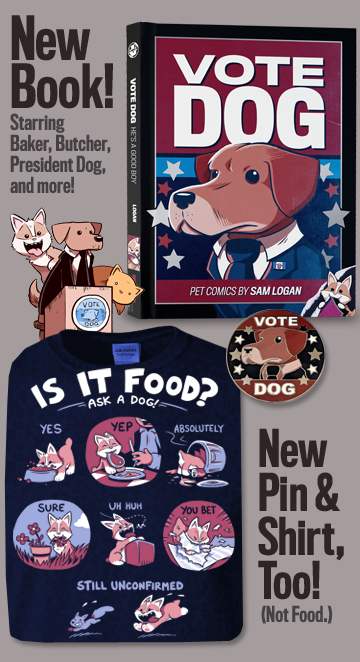 PS: Don't forget, there's only one week left to get in on our final batch of Vol 2. Book Club bonuses! BCiT Tech Days start today! Friends at (or near) BCiT's Burnaby campus! As part of school's "Tech Days", I will be peddling my swag and drawing goofy stuff from 9AM to 3:30PM today and tomorrow in the Great Hall of the Student Association buildling (SE2). If you're going to be around, come by and say hello! It's primarily a computer and videogaming-themed event, but I'm sure no one will mind that I'm sneaking in my non-tech-themed comics and prints to go alongside my more video-game-y wares. At least, I don't think anyone will mind. To find out, swing by my booth to check for corpses! Right! It's a little late, but the final Book Club Bonus Pack will be mailing out soon. Here's a peek! Members will be getting two brand new desktops this time around: a Cowboy Bebop parody (paying homage to this classic poster), and a scene from our cat-filled "Animal Kingdom" arc that will also be serving as the back cover art for our next book. (Coming out later this year!) And as a bonus for newer readers, I'm also slipping in the classic "Mega Fuzzy" desktop from Volume 1. 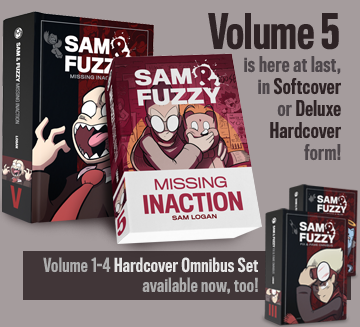 As always, these bonus will be emailing out free to anyone and everyone who has purchased a copy of Sam and Fuzzy Are Very Famous. If you haven't already snagged one, just be sure to nab a copy (or one of our book 2-packs) by September 19th, and you'll get 'em too. Tom, I don't know how to tell you this, but it looks like someone indiscriminately stole some (but not all) of your "th"s and replaced them with "d"s! But yes, both those robots are part of the same "line", which also includes the Non-Disclosure Automoton. The sentient members of said line are one of the Sam and Fuzzy-verse's many... uh... species... that are generally confined to the underground. It's something I'd love to explore a little in a future chapter! If Sam is actually Fuzzy, then these current strips are getting really complicated!